One of the lesser known facts about Andrew Bolt is his connection with the Commonwealth Games. Not the carnival of athleticism and lawn bowls kicking off today on the Gold Coast, but the Brisbane affair of 1982. Readers might recall the event’s mascot, Matilda the fibreglass macropod, which the ABC today reports is still around. Well, when all 13 metres of Matilda was paraded at the opening ceremony, inside that blinking and ear-woggling head was a young Andrew Bolt who was reporting the event from a unique vantage point for The Age, where he was then a cadet. Apart from providing an answer to what, one day, might be a question for trivia night at the local pub, there is another reason to mention that exploit: Yasmeen Abdel-Magied, the motormouth with a Twitter account, has interrupted the self-imposed exile with which she set out to punish Australia for reacting badly to her politicisation of Anzac Day. It was all racism and intolerance, don’t you know. So she packed up and decamped to London. Well today on Twitter, Ms Abdel-Magied wonders, apropos of nothing but an apparent desire to be noticed, “what merit” Andrew Bolt, and Alan Jones as well, “qualifies” them for “their platform”? For those with poor eyes, a click on the image below will render it large enough to read. Oh, the irony! Ms Abdel-Magied’s return to Australia was prompted by the launch of her acting career — is there nothing this woman cannot do? 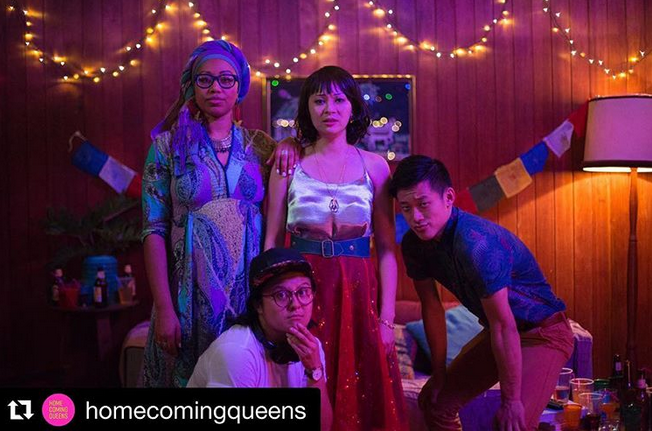 — on an SBS show, Homecoming Queens, a series underwritten by Australia’s taxpayers via Screen Australia, Film Victoria and Screen Queensland. That’s a still from the production atop this post and, while not evident in the photo, yet even more taxpayer money has been at work to gather that little band of mates. The series is co-authored by Michelle Law, sister of Benjamin, who is pictured at right making a more-than-customary silly face. Between them, as reported at Quadrant Online, they have bagged a total of $50,000 from the Australia Council to further their artistic endeavours. Oh, and the picture? Well that was snapped by a third Law family member, Tammy, who picked a neat $13,013 late last year from the Australia Council to further her shutterbuggery. If Ms Abdel-Magied is genuinely curious to learn how some people achieve the success and prominence they do, her question might better be directed to Homecoming Queens’ ensemble, rather than Andrew Bolt, whose success owes nothing to peer assessors, grant applications or having a posse of lovely leftoid mates with whom to swap bon mots on Twitter. Simply put, Bolt has spent an ink-stained lifetime working his dot off, from sweating inside a giant kangaroo to pumping out columns, books, a blog, TV shows and radio spots. More than that, he has found a large and appreciative market for his thoughts, so no taxpayer largesse has ever been needed. Mind you, were Bolt ever to identify as a crippled Aborigine of flexible sexuality and swap amiable tweets with arts bureaucrats, he could probably snaffle a grant or two as well. One day, if Arts Minister Mitch Fifield does something about public money being given to, among other recipients, an artist who plays with her poo (perhaps by moving the Australia Council’s HQ to, say, Walgett or, better still, Andamooka) Ms Abdel-Mageid will understand a little more about that “merit” thing which set her to wondering. She might even grasp that the market, unlike the Australia Council and bodies keen to have a colourful token on their panels, is rather harder to separate from its cash. For those with an idle moment or two and curious about arts funding, follow this link or the one below to the Australia Council’s grants page. Have a poke around, see who gets how much for what, and perhaps wonder if there might not be a better way to promote art and beauty on the taxpayers’ dollar. Hey, kids, let’s play ‘Blackout’!